In the third installment of Carly’s blogs about her time in South Africa, she tells us about her weekend adventures at the Big 5 game reserve. There are several options for the weekend which is great. You leave on Friday after the first activity so it’s always a 4 day week! You have the option to stay at the reserve, Port Elizabeth, Jeffries Bay and Plettenburg Bay. If you want to go anywhere else it’s on your own accord. Jeffries Bay and Plettenburg Bay you have to pay to stay at the hostel and transport but it was approximately £50 maximum for the whole weekend so it’s worth it as there are so many activities in these areas. A chance to go to the beach, eat, shop and go out for drinks. There’s a mall called Bay West and a food area called Boardwalk. There’s a bar called Beershack, which everyone raves about, however I didn’t get the opportunity to go. The chance to do lots of surfing if the weather is right, unfortunately for me it was bad the whole time and cold! Layers is good for when it’s windy and there are factory outlets nearby if you want Billabong, Ripcurl and some souvenirs. The bar at the hostel serves food and alcohol, which is cheap and a great social area with beer pong and there was a kitten when we were there! We got to ride horses on the beach for 14km (about 2hours! ), which was great fun at approximately £20, but your bum is pretty sore afterwards, if you’re not used to it! Also you might get a stubborn horse who doesn’t want to go, my horse and I almost sunk into a steep sand dune! Someone else had to jump off their horse as he wanted to roll in the sand, so beware they might not be as tame as you think, even for a beginner! Approximately 3hours away, but worth it for the number activities available. 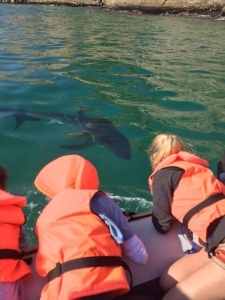 We planned on going swimming with the seals, but because of great white sharks in the water we could only do a boat ride to see them. Sky diving was another opportunity however was fully booked so we didn’t get the chance and zip lining but the weather was too cloudy. Some of the others did Africanyon, which involved jumping into pools within the canyons, too extreme for me! So I did a half day at Tenikwa Wildlife Awareness Centre. I did a photography combo package for around £50, which included a sunset cheetah walk and the opportunity to photograph the animals in a natural environment. I was allowed into some of the enclosures, one of which a serval nuzzled into me, which was the cutest thing ever! However I was only allowed to touch them if the game ranger said, they are wild animals after all. The leopard walked above me, which was amazing to see such a beautifully marked creature at a different angle! The cheetah walk was great too as I got to do it with other volunteers as they did a full day at the centre. They got to help feed some of the animals and administer medicine to hurt animals, which was called a Crazee Cat Day at approximately £100, which was also such a good buy! The cheetahs were not sedated and were hand reared so were used to humans and were walked for their enrichment and were held loosely and we only went where they wanted to go and if they wanted to stop and lie down we’d stop. I’m surprised how little they wanted to walk. They used to walk the leopard but he got naughty climbing trees! There’s also a bar club place nearby for the evenings called Flashbacks, which is a great night out! All in all it’s a must do experience and you meet so many different people you’ll keep in contact with. I’ve met Australians, Americans, Belgians and Danish. You have unforgettable memories from a unique experience. That’s all I’d advise is to go there for at least a month as there is so much to do around the Eastern Cape. Even consider doing their garden route experience as you get to go to even more places, do even more experiences and you end up in Cape Town! Also take a decent camera and even a Go Pro if you can manage it all! 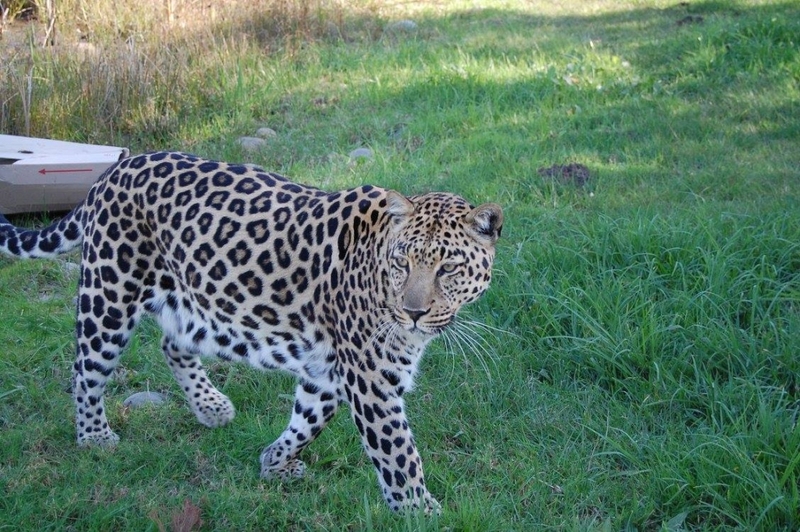 To find out more about Carly’s project at the Big 5 game reserve, check out our conservation experience project here. Next Post Can&#8217;t afford to take a gap year? Think again. Previous Post Paid Work in the Outback, why is the training week so important?